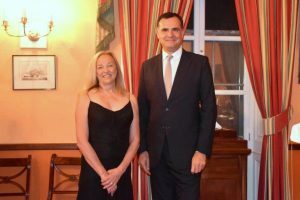 On Wednesday evening, 17 October 2018, Her Excellency, Governor Lisa Honan, held a reception at Plantation House to honour the visit of His Excellency, Christophe Farnaud, Ambassador of France to South Africa. 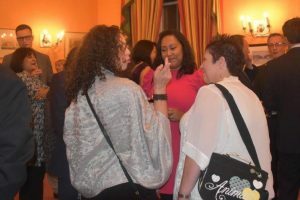 The reception began at 6.30pm and gave invited guests the chance to engage with the Ambassador, and to speak about the connections between France and St Helena and the heritage they share. Governor Lisa reflected on the first year of commercial flights and the benefits to tourism. The Governor, in speaking about the obvious links and Napoleonic heritage, took the opportunity to remind guest present that tourism is everybody’s business. The Ambassador of France to South Africa arrived on Saturday, 13 October, and is due to depart St Helena on Saturday, 20 October 2018.